Pruning saws are a must have for any homeowner who does not want their yard to eventually become overgrown in a mass of tangled tree branches. 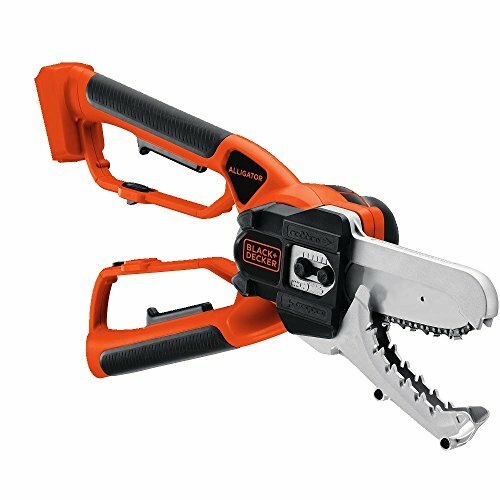 Pruning saws are a simple, effective way to keep your yard looking like you employ a professional landscaping crew. Read on to learn more about these awesome tools. What is a Pruning Saw Used For? 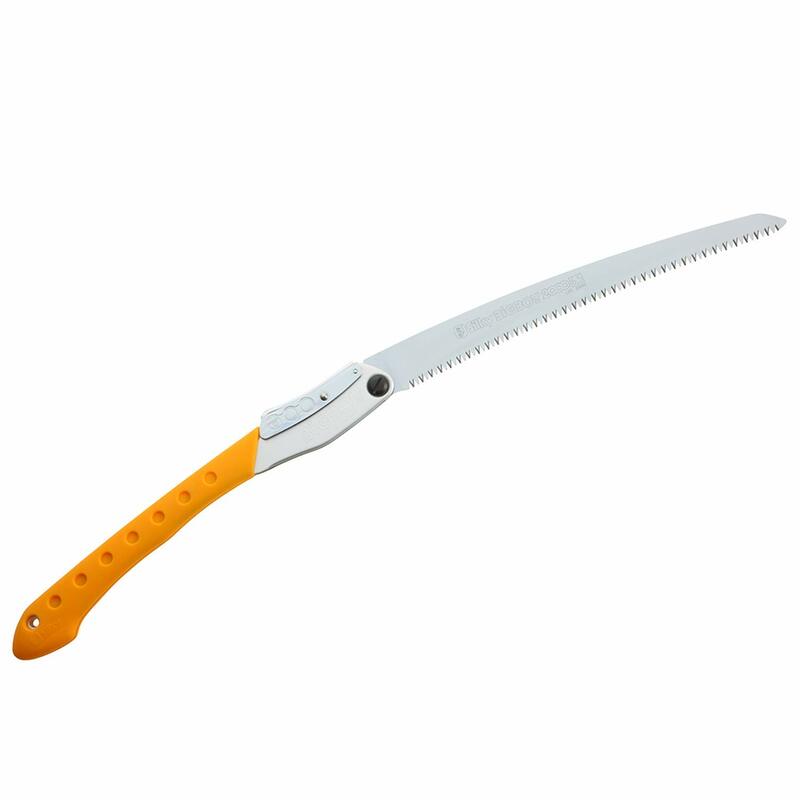 A pruning saw is primarily intended to be used for yard work – for pruning tree branches that are getting a little too close to your roof, or cutting down small saplings that have taken root in your yard. However, these are versatile enough to also be carried along on camping trips and used for chopping firewood. As mentioned above, these do not have to just be used for working in your yard. They can be brought along on hiking or backpacking trips, and they are also pretty handy when it comes to emergency survival equipment. You want one that will be able to cut through a wide variety of different kinds of wood and plant growth, because you never know when you might need it. You are going to be carrying this all over your yard at the very least, and potentially with you up into the woods, so you want to make sure you can bring it along with you wherever you need to go. A number of pruning saws come with their own sheaths, and even some with sheaths specifically designed to be looped onto a belt or a backpack. These are, by necessity, incredibly sharp. You will want to make sure you invest in a model that, if it folds, has a sturdy locking mechanism to prevent accidental opening, and, if it does not fold, comes with some sort of protective cover so you are not in a position where you could unintentionally hurt yourself. The Silky Professional Series BIGBOY 2000 is a fantastic option that will be able to serve a multitude of purposes. If you are looking for one primarily to clear some aspects of your garden or yard, this Silky will do it for you. 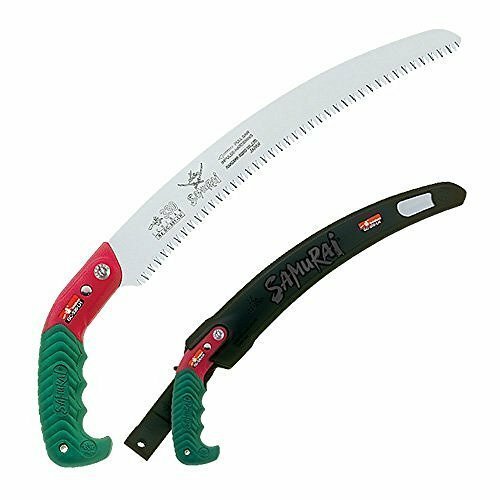 If you are a gardener who also happens to like going camping or backpacking, and you need a saw to cut firewood or to clear your path of brush, the Silky will also come through for you there! There is not much this one will not be able to do. It is lightweight, so it can easily be carried along wherever you need it to go. It can cut through a wide range of different kinds of wood, from the slimmer branches on smaller plants all the way up to thick logs (yes, logs) up to twelve inches in diameter! If you are looking for a model that can get it all done in any circumstance, you will not be able to go wrong with the Silky Professional Series BIGBOY 2000. The Silky Professional Series BIGBOY 2000 is the ideal pick that will always be there for you, no matter what project you put in front of it. Just be mindful that it does not come with its own sheath. If you are a little spooked by the Silky’s lack of a sheath, and you are looking for a model that can still handle cutting trees but comes with a little bit more of a safety assurance, you will find it in the coher Folding Hand Saw + Plastic Case. Users report it cuts through tree branches with as little resistance as a knife would cut through soft cheese! This hardy cutting ability also translates to an incredibly smooth cut, meaning this could probably also easily be used for woodworking projects. The blade locks into two different positions, as well as completely closed, and it strikes an excellent balance between flexibility and rigidity. There really is not much you could not do with it. 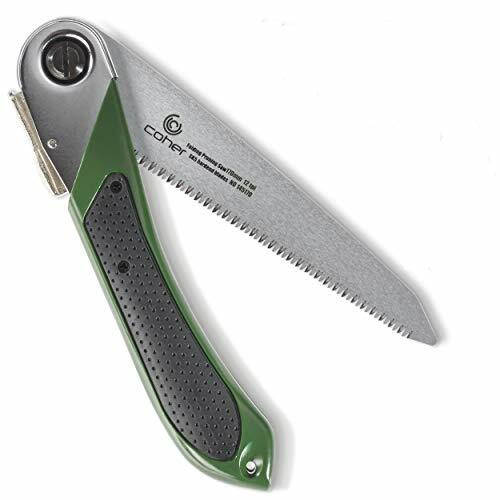 The coher Folding Hand Saw + Plastic Case is an excellent little option that you could use for a wide variety of different cuts, though it is most effective on pruning trees. You may need to put in a little bit of extra effort to open it, but that only adds to its overall safety. The Corona RazorTOOTH is an excellent option for on the go pruning jobs. Its size (the blade is seven inches in length) is just about perfect for handling it with ease, as well as conveniently sticking it into a side pocket when you are on the move. Speaking of the blade, this shiny chrome metal will not become stuck in wood, even when that wood is soaked through, so you will not have to worry about bringing it along camping in inclement weather, or waiting for your yard to dry out when fixing storm damage (just make sure that if you do get it wet, you take the time to clean it up properly after using it – the chrome does tend to rust pretty easily). This blade will still be chomping through logs of up to six inches in diameter no matter what the conditions! The Corona RazorTOOTH is a great choice whose size and folding capabilities make it excellent to bring along on the go. Be careful when handling it, though – some of the teeth can remain exposed even when it is fully closed. If you have looked at the most basic level, you know you are going to be seeing a lot of Japanese brands. We are here to tell you that the one you should trust is Samurai Ichiban, with their Samurai Ichiban 13” model. If you are new to the world of these and are feeling a little intimidated or overwhelmed, this is the one for you. It is extremely easy to use – so easy, in fact, that some users who reported dreading their pruning chores in the past are now looking for more pruning projects to do after getting this one! You will probably tire out before this model tires out, though it is true that with its ergonomically designed handle encased in soft rubber, you certainly will not have to worry about hand cramps with this bad boy. It even comes with a hard plastic scabbard with an included belt loop for easy carrying. If you are looking for an accessible choice that will get the job done, look no farther than the Samurai Ichiban. 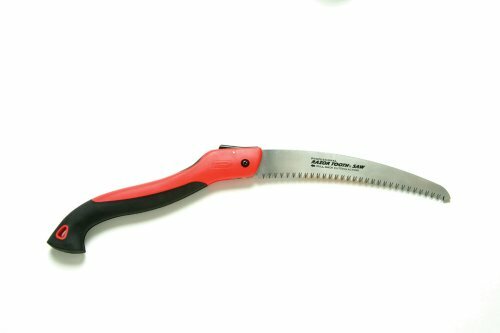 The Samurai Ichiban is a super accessible pruning saw that anyone could use, regardless of their experience level. Just know that it does not make the smoothest cuts out of all the models on this list. When it comes to efficiency in pruning, you can’t really get better than an electric model. And when it comes to these, you can’t really get better than the BLACK + DECKER LLP120B! This saw can buzz through limbs of up to three or four inches in diameter as if they are not even there, and that is true for a wide variety of different kinds of wood – you name it and this saw can probably cut it. It also comes with a number of convenient and protective safety measures, including a safety switch on both handles and blade protectors, which also come in handy when you are cutting close to the ground and could accidentally hit some dirt. You will not have to worry about dirt causing damage! It has a lot of power and will be able to accomplish pretty much anything you could imagine needing it to get done. You can’t go wrong with the BLACK + DECKER LLP120B. The BLACK + DECKER LLP120B is an excellent pick with a lot of efficiency and guaranteed safety features. The only issues are purely convenience based, including changing the battery and the oil. All options will eventually become dull after prolonged use, and there is a very specific process for effectively sharpening your blades. First, you need to understand that each tooth has three edges: the back edge, the front edge (also called the cutting edge), and the top edge. You will initially start out by sharpening the teeth’s back edges. You need to clamp your saw firmly into place (blade up, obviously), and use a file to sharpen each tooth’s back edge. Then, move to sharpen each tooth’s front edge/cutting edge. Finally, you will need to sharpen the top edge of each tooth. This process requires a little bit more finesse as you will need to sharpen each side of the top edge separately. The whole process can be seen more clearly in the video below. 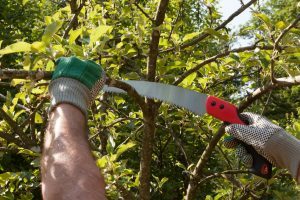 Pruning saws are great tools for keeping your yard tidy in a way that will not require you to shell out hundreds of dollars for tree trimmers or break your back doing long extended labor. Make sure you get a saw that will fit all of your cutting needs, and soon you will be relaxing in your backyard instead of resenting it.